A bow holder is a must if you love these fun and cute head accessories. It’s a creative DIY that yields a practical way for storing your bows. Your daughters, nieces or granddaughters will appreciate a DIY bow holder since it will help them keep everything organized and always at hand. The best part of putting theses bow holder ideas into practice is being able to customize them after your heart’s desire. As a result, they make a beautiful addition to any bedroom or dressing area. 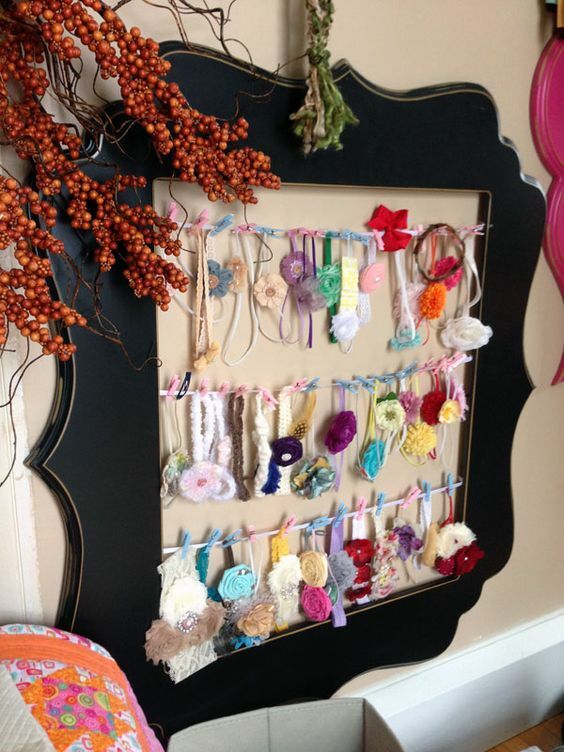 The following 5 bow holder DIYs are flexible and can be adjusted to any girl’s preferences. Feel free to play around with the colors, fabrics, patterns, and fixing techniques so you can achieve something that is truly unique and that represents your style. Here are the best suggestions for a practical, yet gorgeous DIY hair bow holder. An unusual combination, this personalized hair bow holder is super easy to achieve and incredibly practical. Measure out the chicken wire to fit your frame of choice and cut it to the right measurements. Use the glue gun to secure the chicken wire to your frame. Allow it to dry for at least half an hour. Create a bow from your ribbon and leave a loop long enough for your picture frame to hang on the wall. 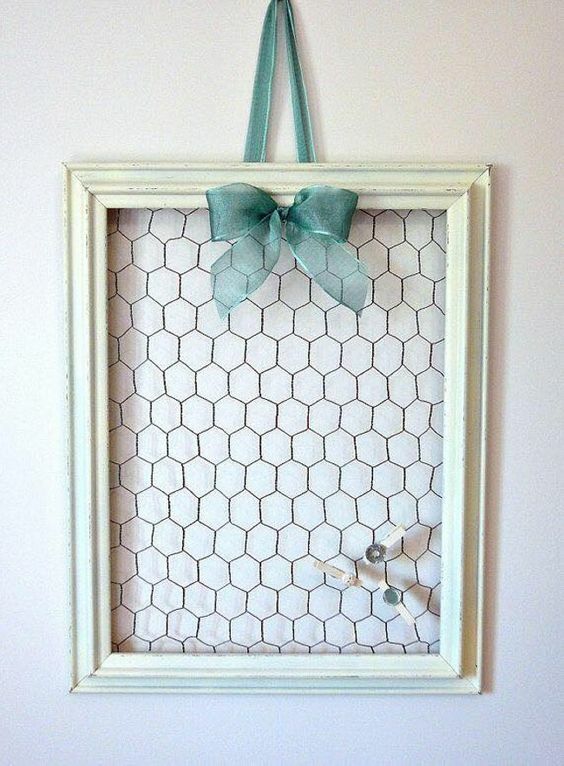 Start adding your hair bows to your new chicken wire bow holder. You can also use S hooks for some hair accessories. Depending on your preferences, you can build up this bow holder by adding different types of twine or by placing a fabric behind the twine for more color. Separate the two hoops and start tying and wrapping the twine around the inner hoop. Keep the pattern random. The twine should be taut. When you’re satisfied with your pattern, combine the two hoops and tighten the screw, cutting the excess twine. Hang your personalized hair bow holder on a wall that will create a beautiful contrast with the color of the hoops and the twine. This DIY will undoubtedly bring a smile to any little girl’s face. Quick and easy, this makes for a thoughtful gift if you’re running late to the party or you don’t have any other better ideas for a gift. Add the hooks to the wider side of your black frame and glue them with your hot glue gun. Make sure to leave at least two inches between them. This way, you’ll have enough space to hand your hairbands. Measure the ribbons and glue them to the frame creating the pattern of your choice. Cut out the “ears” out of your black felt and glue them onto the corners of the frame. Add the pink polka dot ribbon between the two felt ears. 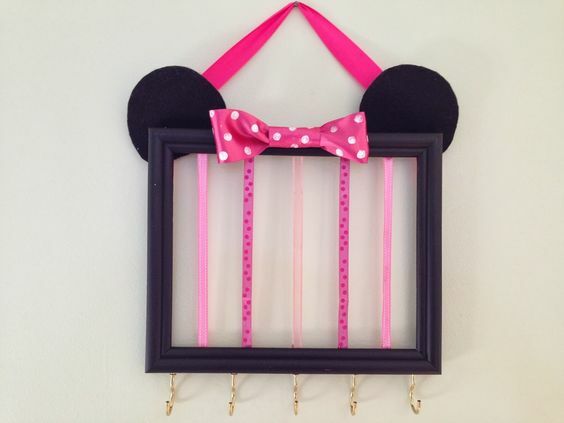 Use ribbon to hang the picture frame on the wall. If you have an old frame with an intricate design in your attic, don’t throw it away just yet. 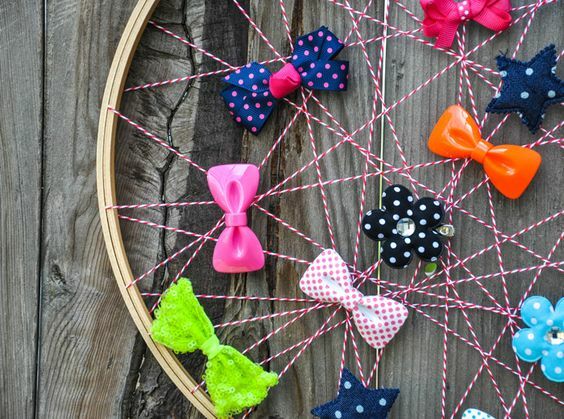 You can repurpose it and transform into this eye-catching DIY hair band and bow holder. Prepare your old frame by removing the picture or the mirror. Optionally, you can paint the frame or give it a distressed look. Use the hot glue gun to add the ribbon that will hold your bows and hairbands to the frame. Measure carefully and leave enough space between the ribbons to allow you to hang your hair candy. Use the colored wood mini clothespins to secure hairbands and bows in place. Hang the frame on the wall or place it on your vanity table. 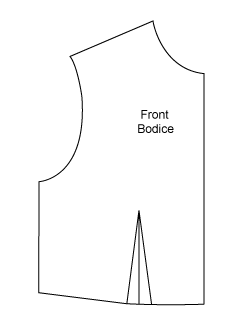 Draw the template of the bodice (or use an online one) on the cardboard and cut it out. Glue the batting to the bodice template. Wrap the fabric around the bodice, adjust to the shape, cut the excess fabric and glue it down. Start gluing your tulle at the bottom of the bodice until you create the full shape of the skirt. 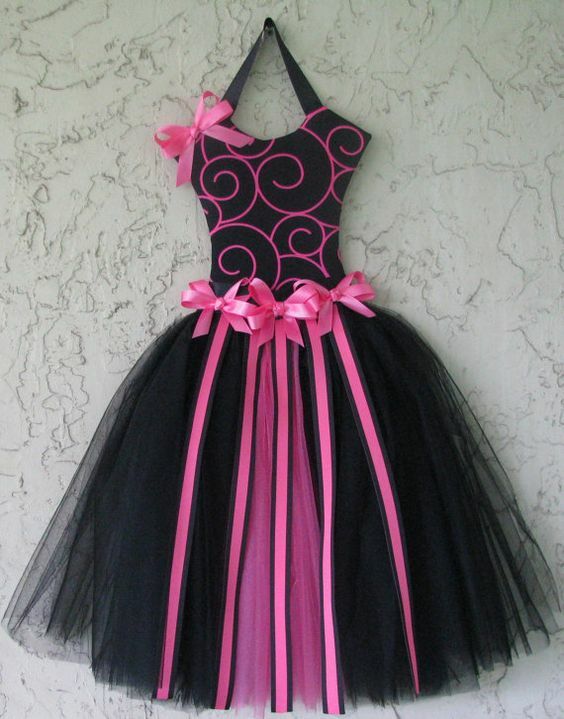 Add the thin ribbons across the tulle that will hold your bows. Hide the ends of the tulle that was glued on the bodice with a thick ribbon. Add another piece of thick ribbon at the neckline of the bodice that will serve for hanging the tutu bow holder on the wall. Now that you know how to make a hair bow holder you can experiment with your own ideas ad create new DIY projects to adorn your bedroom.